Sprint previously said today was the day for LG G3 preorders to start, but checking out the Sprint site seems to show the device ready for purchase right this moment. Sprint's store finder tool even reports it in stock all over the US. 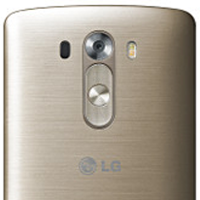 Oh, and you can get that snazzy (some might say gaudy) gold version of the G3 exclusively from Sprint. The G3 on Sprint is rocking the same hardware you'll find in the other US models including a 5.5-inch QuadHD LCD, a Snapdragon 801, 32GB of storage, 3GB of RAM, and a 13MP laser-focused camera. Yes, it is a very powerful device. Sprint is pushing its Framily plans pretty hard these days, but you can't get those accounts set up in stores for whatever reason. You'll have to wait a few days for shipping. If you go with the 2-year contract for $199.99, you can pick the device up in stores today. Apparently Sprint decided to stop playing coy and just sell the thing.